All Good Cafe | Who's Cooking for Kacey? How could you not have a good day when you’ve got nothing else scheduled but a leisurely breakfast with one of your favorite people? It is rare that any person gets to spend a day with almost nothing on the agenda. I think it instantly sends you into vacation-mode and it’s a great way to give yourself a much needed break from the every day. What do you do when you want to try a new restaurant but they do not have a Chai Tea Latte on the menu? Well, you make two stops, of course! And if you have Chai Tea on the brain, then you go to the best place that makes it that you know of, which for me, is Buzzbrews (I will continue to look for the next great chai tea latte and report back ASAP when I find it). When I see this sign in the morning, I know it’s going to be a good day! Not everyone would be open to the idea, let alone excited about going to two restaurants for one meal. A man might say it’s a waste of time and wouldn’t want to make two stops, and a girl that’s calorie-obsessed might look a bit panicked when you suggest going to two restaurants for one meal. It’s hard enough to pretend to eat/enjoy food at even one place. Good thing no one like that was there to get in our way. 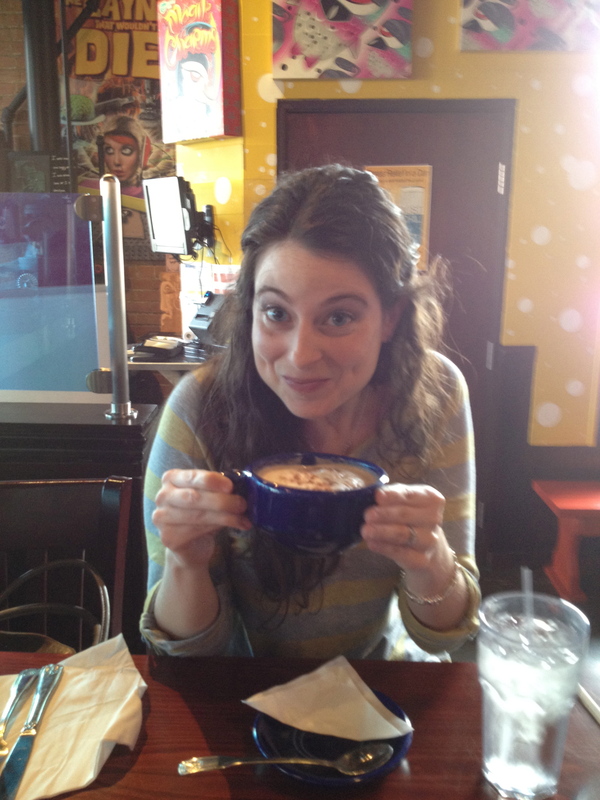 Kristin does not judge a plate…yours or hers. If I want to pile up chicken fried steak and scrape the gravy off of my plate, she would just sit back and happily smile that I was enjoying every bite. Now If I were to start to lick the plate clean, then she would have an issue…she’s classy like that and thankfully I would never do that in public, so we’re good. 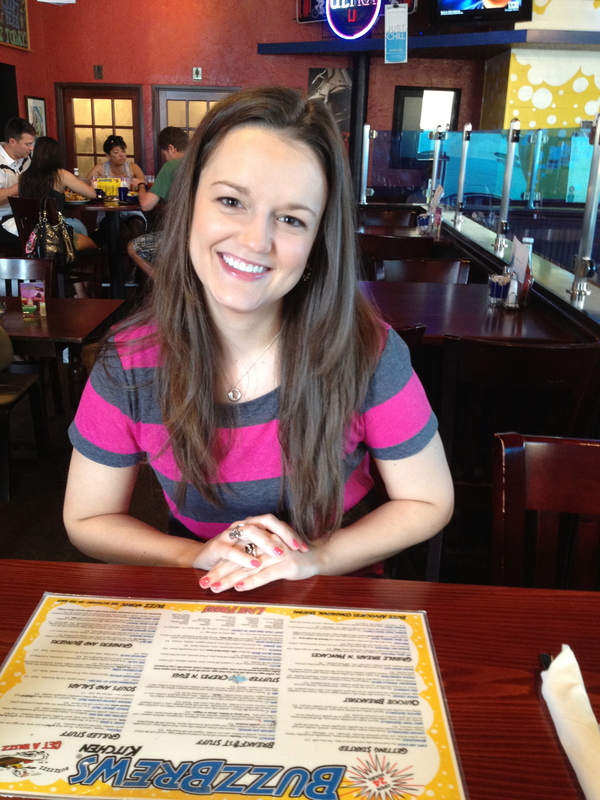 Kristing (sister #3) - It's her very first time at Buzzbrews! This is the kind of person you want sitting across from you at the table…a fellow food lover. And it’s the type of friend I’ve always chosen to hang out with at the table ever since I can remember. Two childhood friends come to mind. The first one is Amber, a girl that would rock a Chili’s like nobody’s business. I watched in awe as she began with an Awesome Blossom (you remember, the giant fried onion with dipping sauce that contained so many calories they had to remove from the menu when people started becoming aware of a thing called “calories” ) moved to an Old Timer with Cheese and then rounded out the whole meal with a chocolate milkshake. I’m still in awe of her. Then there is Shelley, who could eat her way through Olive Garden’s Tour of Italy (which is basically three meals on one plate) before you even make it half-way through your plate of noodles. Hey, we were athletes and played every sport imaginable and sometimes even had two different sport practices in one day; we needed the calories. I love those girls. They are the type of people you look forward to sharing a meal with and that you can be your goofy self around without fear of judgement. Best Chai Tea Latte that I've found so far. Now this is the face of someone that's almost giddy. 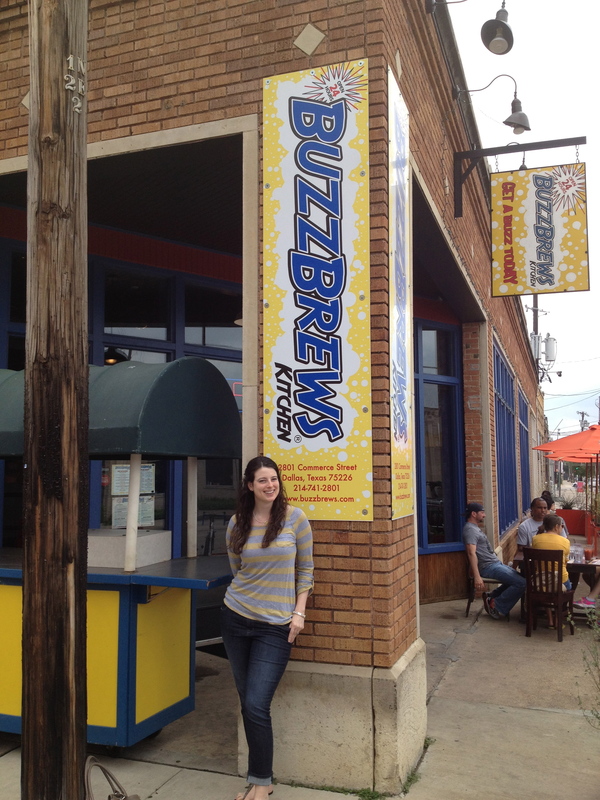 Kristin is now officially a fan of Buzzbrews. All it took was one taste of the Chai Tea Latte and I think she was hooked. The sweetness, spiciness, and creaminess blends together perfectly. We also ordered a small Jailhouse salad, which is a fruit salad served with honey dipping sauce. It was a great first breakfast course and warm up to our next destination. 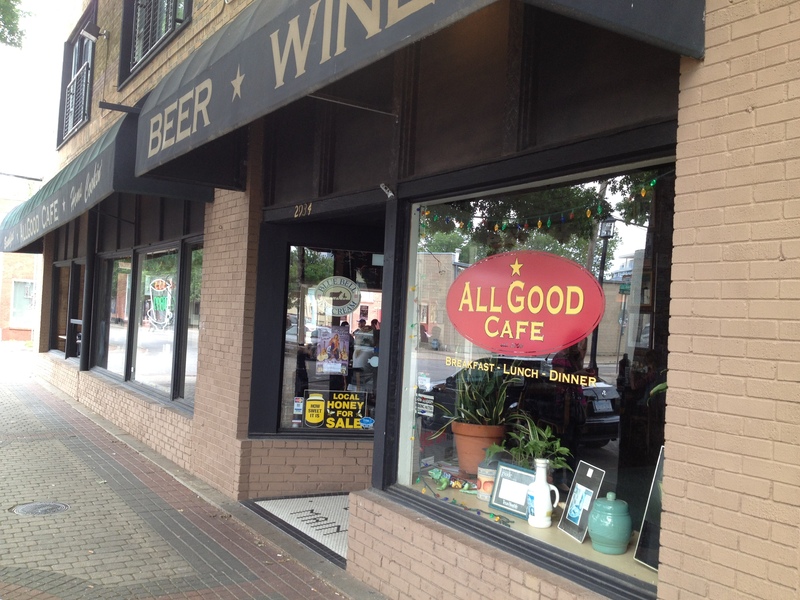 All Good Cafe is a place I’ve been wanting to try because my baby sister, KaLynn (#8), loves it so much. Every time she visits Kristin (#4), they always go to breakfast here and frankly, I was feeling like I was missing out. 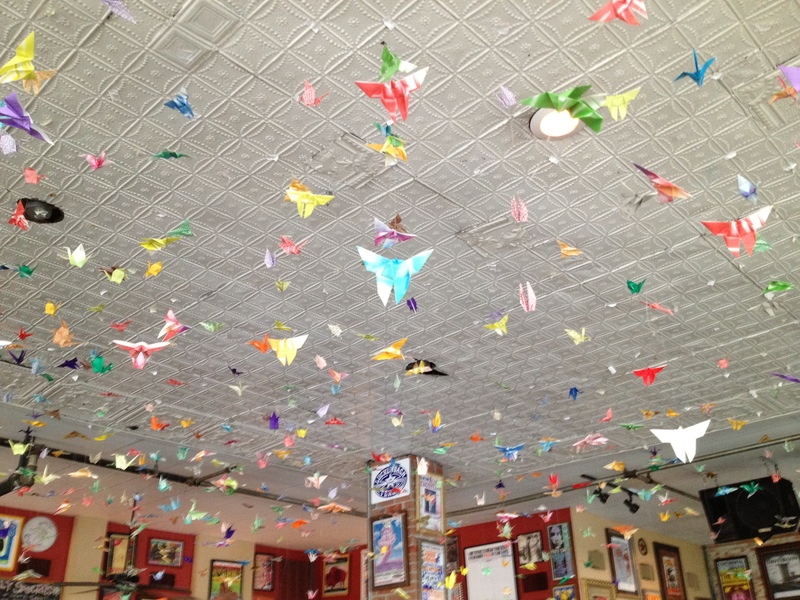 The place is located in Deep Ellum and music definitely inspires the decor. They even have a stage where bands can come and entertain. This is a typical breakfast/diner type of joint but with exceptional, local ingredients, which is what all diners must want to be when they grow up. Nothing too strange or crazy on the menu, here, just good breakfast fare. I think I tried to make breakfast look more like lunch when I ordered the Mega-Egg Sandwich. 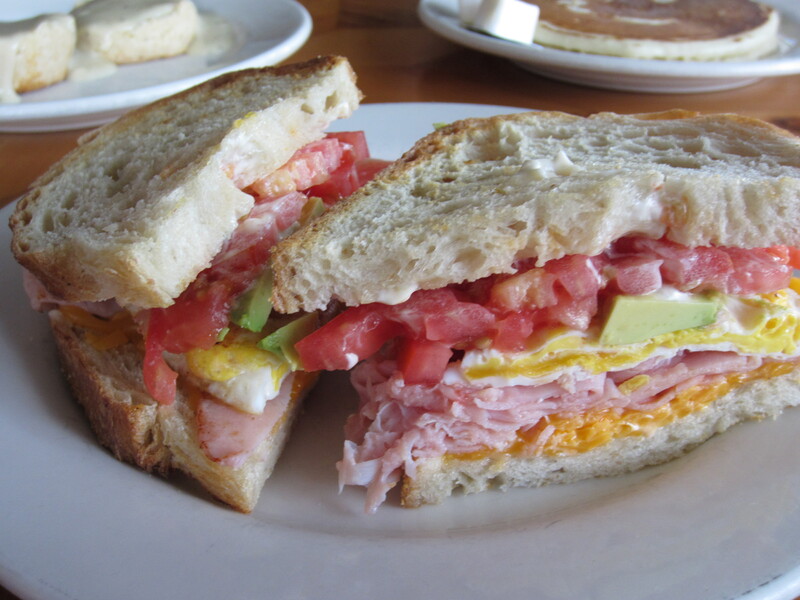 It was more like a club sandwich that happened to have an egg on it than a true breakfast sandwich. It was good, just not quite what I was anticipating. The sourdough was perfectly toasted and buttered and I loved every bite. There was a little too much tobasco mayo on there for my taste, and I think this is also what contributed to it seeming more like a lunch dish. The egg tasted fresh and so did the tomato, avocado, and cheddar cheese. 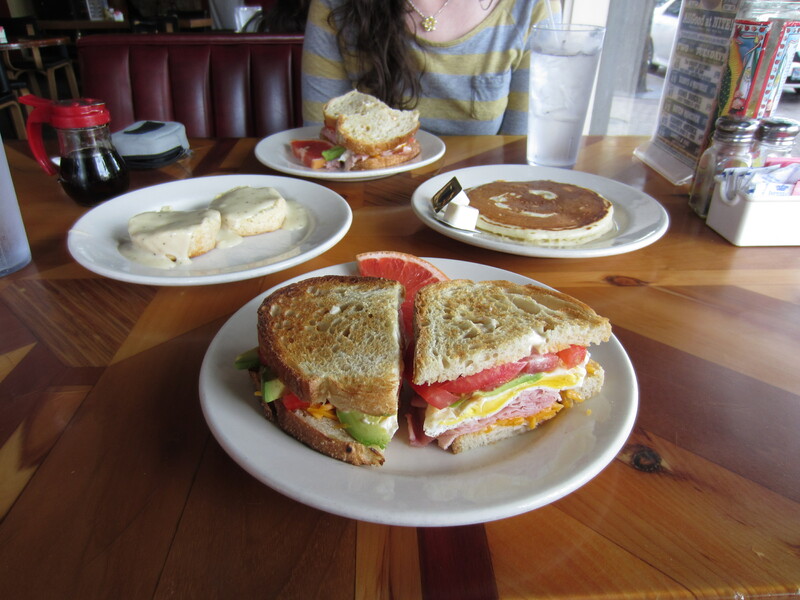 We didn’t stop with the sandwich, we also wanted a pancake and a biscuit and gravy to share. Our morning spread....next time we'll be smarter and each order a different sandwich and trade. The pancake was fluffy and large, just how I like them. I can see why my 10 year-old sister loves this place. 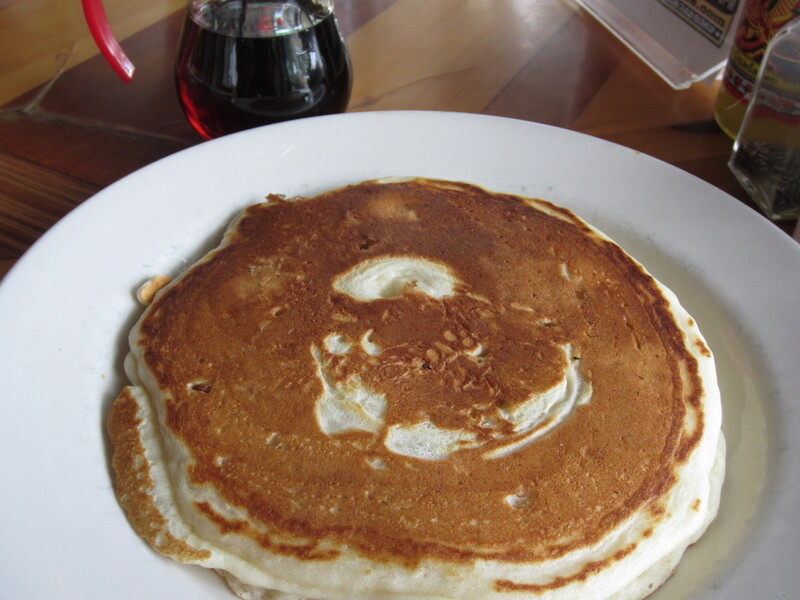 With pancakes like these, I bet All Good Cafe is often requested by kids. And it sure beats the heck out of McDonalds or any other most-requested-kid places we reluctantly find ourselves. 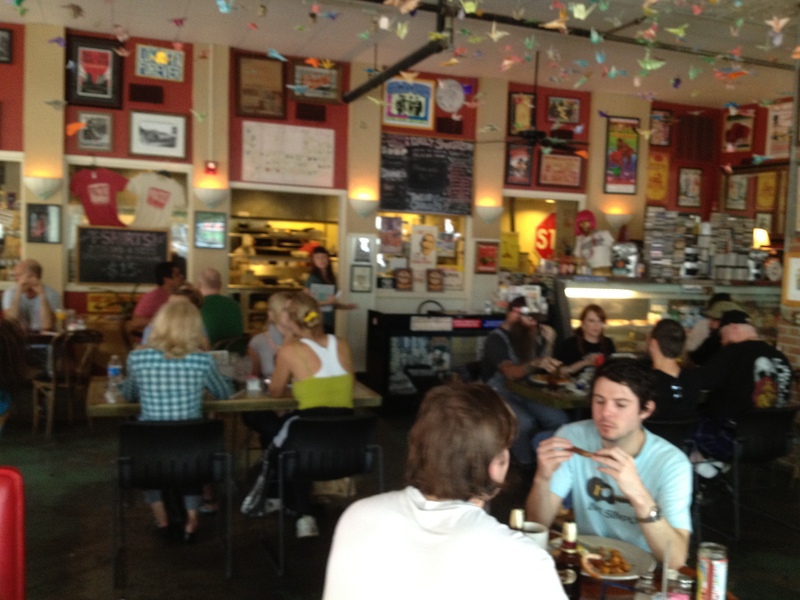 Parents should be herding their children to All Good Cafe in droves. These boring little biscuits were actually the favorite and definitely not dull-looking in person. 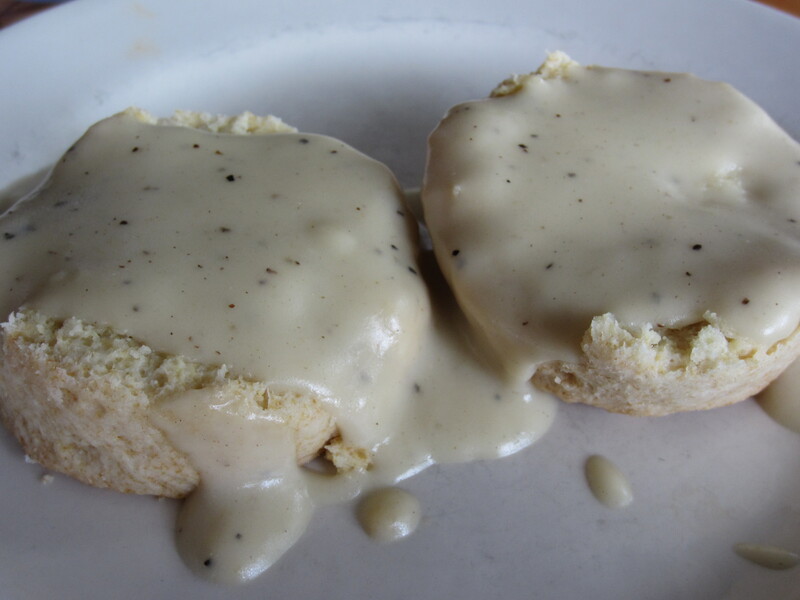 The biscuits and gravy summoned thoughts of cowboys making biscuits over the open fire. They were thick and dense and covered in homemade gravy. Their texture made them quite interesting, as fluffy biscuits they were not. These are a great side-order addition to an entree. I consider myself lucky when I get to make it to one restaurant for breakfast, two just puts things way over the top. I was in Saturday morning heaven. I encourage you to try a 2 in 1 breakfast the next time you have a day with nothing to do but indulge yourself in food and bask in time. Be sure to bring someone with you that is able to truly enjoy the experience like I did. Do you know of a good place to go for a Chai Tea Latte? I’d love to know about it. I may just visit your restaurant choice next.